Are you looking for a fun costume theme for your group of friends this Halloween? Or maybe you just want to find a costume that’s easy to toss on and doesn’t need any explaining. Well, we’ve got the perfect costume for you! 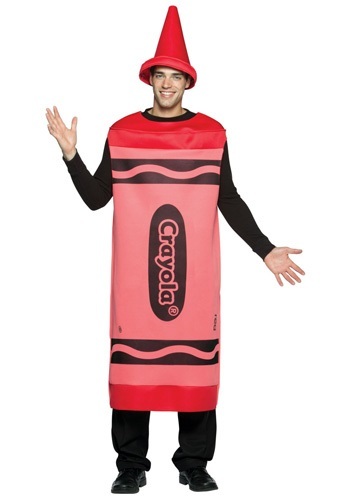 Check out this Adult Red Crayon Costume. Convince your friends to go out this year as a pack of Crayola crayons, you guys would be the most colorful bunch in the party scene. Coordinating the costumes would be super easy too, just make sure no one wears the same color! Of course, if you’re just looking for a straightforward costume that is by no means complex, this tunic and headpiece combo is perfect. No one will have to ask who or what you’re supposed to be, and if they do… well, then you can just feel free to walk away. Another neat feature about this costume is that it is totally PG. Everyone can enjoy it. Kids will be reminded of the unfinished masterpieces they have waiting back at home and adults with fondly remember the days when they had enough free time to enjoy their artistic endeavors in their youth. So it’s fair to say that this costume will be a hit no matter where you wear it. Now you just need a black long sleeve shirt and some black pants. After that, you’ll be ready to add a bit of color on a night that’s notorious for being rather dark. So have fun being a classic school item come to life! The costume is super cute, the quality of the materials seems great. But it's by no means red. Much more of a pink. This costume is perfect, easy, and comfy. Love it!